Burberry will launch the 2010 versions of Burberry Summer in April. 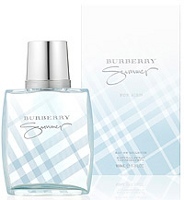 Burberry Summer For Men 2010 (shown) ~ A woody aquatic citrus with notes of yuzu leaves, mandarin, mint, juniper berry, thyme, driftwood, gorse, cedar, sandalwood, amber and musk. In 100 ml Eau de Toilette. Burberry Summer For Women 2010 ~ A fruity floral with blackcurrant, pomegranate, mandarine, white peach, freesia, honeysuckle, lily of the valley, rose, cedar, sandalwood and musk. In 50 ml Eau de Toilette. Whenever I read that a new fragrance contains an “aquatic” note, my wallet breaths a heavy sigh of relief knowing it will not be tested, therefore $$$ saved! I’ll actually want to try the men’s for the heck of it — juniper berry and yuzu work for me, and there *are* a few decent aquatics, even though I have my bases covered already in that department. Yes, there are…but I have plenty of them too. “Aquatic citrus” sounds like the olfactory equivalent of brushing your teeth and then drinking orange juice. But maybe that’s just me. I prefer to think of it as eating a just-picked citrus fruit while sitting in a coastal Mediterranean garden enjoying the salt breeze. A more favorable image, to be sure! Yup, sorry Miss K, but I like Joe’s version better, too. Oh no I will pass I just can’t do Aquatic. I liked the women’s 2 years ago, but didn’t know it was an LE (or, to be honest, at that point that there WAS such a thing) and passed it up. No huge loss, as it was merely nice when I was looking for wow. The peach gives me pause, but I’ll probably give it a sniff in passing anyway. I’m sorry to say I don’t think I’ve ever tried one of the summer versions! The bottles are cute. I doubt you’d love them, though you’ve surprised me before. The womens sounds okay though I’ve never been a huge fan of the brand save for Baby Touch, which I bought for my youngest. I know DH picked out one of the line for men, and while I thought it was okay at the time, I think all the ginger eventually got to me and I can’t stomach it very well these days. So, he wears it to work and by the time he’s home, it’s pretty much gone anyway and has just the barest traces, which is much better on my stomach and nose. I like a few of the Burberry scents. I was looking forward to sampling the women’s until I read honeysuckle. When there is a single note that I don’t like in perfumes, it always turns out to be the predominant note. Aquatics are perfect for summertime. Im looking for something to top Bvlgari Aqva. What exactly is everyone looking for in a summer fragrance, if not this? A gorgeous citrus, or a light springy green (Ninfeo Mio!) or a cheerful light floral. Or, an unusual fruity floral like Parfums de Nicolai Eau Exotique. Robin, is Eau Exotique still in production? I read your review and it looks absolutely succulent. I’m sure my being a sucker for all things mango doesn’t hurt. This summer, I’m going to pick up some Elizabeth W. Sweet Tea. I figure it will be great on its own or layered with Eau d’Hadrien if a little more oomph and staying power is required, and the E d’H in EDP stays on my skin an amazingly long time. I’m a fan of the Burberry Summer that came out a couple years ago. It’s kind of a barely-there scent that’s just very prettty. I’ll probably try this — I’ve liked several of the Burberrys enough to buy. Was it Burberry Brit Sheer? It was a sheer ivy scent that wasn’t for me. No, this was called Burberry Summer and had kind of an apple-floral scent. I think the only one I own at the moment is the Beat Elixir — really like it! I’d love to try the Elixir — I have the Beat and I like it a lot, but I’ll bet the Elixir is better. I really like it — much deeper than the original. Headed Straight to my Burberry store to order a bottle of this! Sounds SO up My alley… after Discovering L’eau Par Kenzo and L’eau De Issey i have always favored the fresh bite of aquatic fragrances, they seem to work wonderfully on my skin, especially if there is some Zesty Citrus (Yuzu, Anyone! ) or Clean Musk in it… this mens version sounds DELIGHTFUL! and loving the bottle and packaging, So Fresh, So Clean, So Blue! The Womens Version sounds Yummers too! all of my favorites.. White Peach, Mandarin, ROSE, FREESIA, Meuget, if there was some Osmanthus or Coconut in it i might damn near wear it myself! want a bottle!